After days of veering between rain and sleet, we’ve finally settled into some snow. The garden’s made it through the end of the year, the sunny day giving us the chance for one last harvest before the cold overcomes it. Gardening in winter brings its own set of challenges. 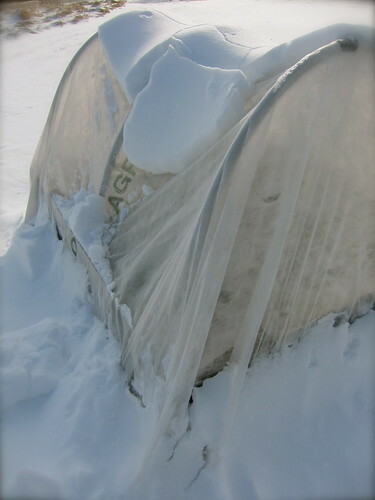 The beds had to be dug out and the covers unstuck from where they’ve frozen in place. 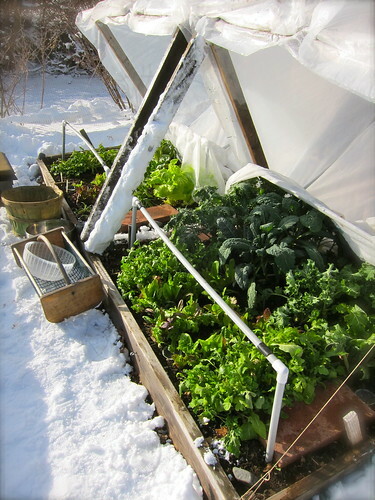 In the greens bed (above), plastic covered hoops and an inside layer of fabric has kept the soil from freezing. It was a joy to get our hands dirty, the residual warmth of the soil counteracting the frigid air. No plastic, just a double layer of fabric row cover over the tatsoi bed. The heads are usually upright in warmer weather. With the cold, they’ve become flat as dinner plates, hugging the ground in self protection. 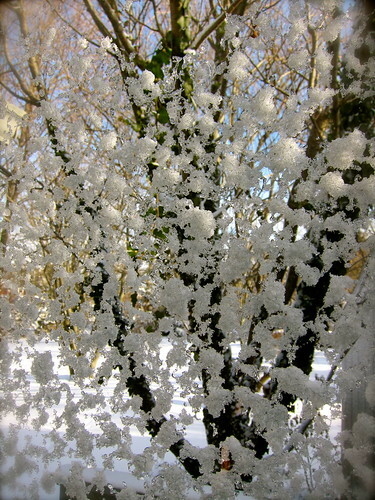 Though the tops appear viable, we were astonished to find their roots encased in a clump of frozen soil when pulled up. We left the last head in place to further test this hardy green’s tolerance. 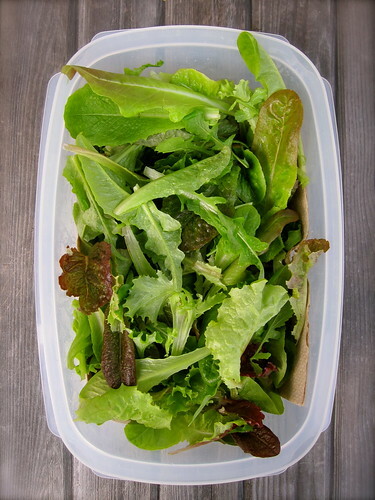 Salad greens and Fordhook chard — Both seemed cold-damaged when harvested, and revived in washing. A few half rows of the more cold-tolerant salad greens and nubs of baby chard were left under cover. 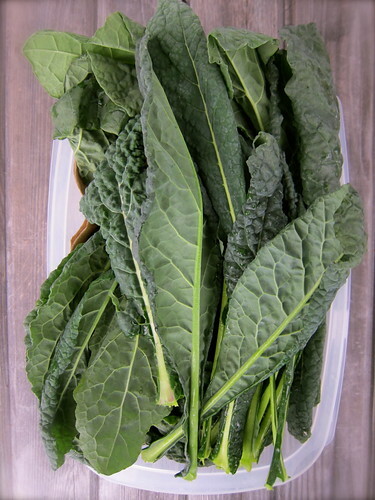 Lacinato, and Siberian and Red Russian kales — All of the larger leaves harvested; the stalks and attached baby leaves left under cover in hopes for a spring crop of kale florets. King Seig leeks — Half of crop harvested; the remaining left under cover, mulched and in-ground to keep this cold-tolerant variety. 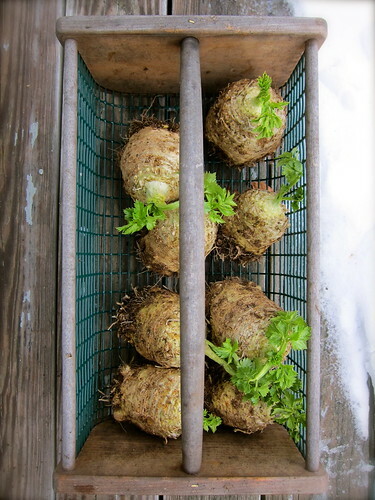 Brilliant celeriac — The last of the remaining bulbs harvested for inside storage. 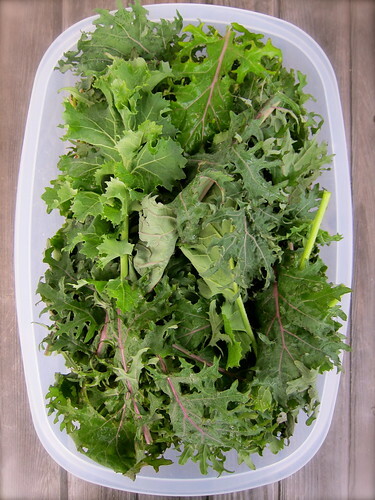 December harvest: Salad greens, chard, kales, tatsoi, leeks, carrots, celeriac. Experiments: Salad greens, arugula, chard, kale, fun jen, puntarelle and pan di zucchero chicories, tatsoi. 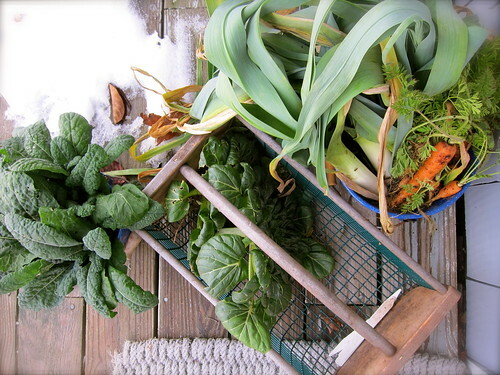 Waiting for spring: Garlic, parsnips. This entry was posted in garden and tagged carrots, celeriac, chard, kale, leeks, salad greens, season extension, tatsoi. Bookmark the permalink. That’s a huge end of year harvest. 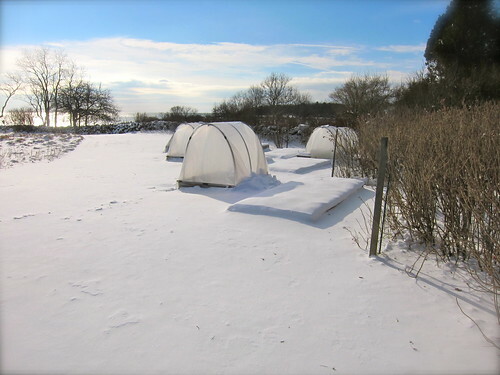 My garden is not protected so will see how the kale and collard survive this frigid weather. I think the parsnips will survive especially since the ground is cover with snow giving them some protection. Congratulations on a beautiful winter harvest. Seeing that we can’t get the temperature inside above 64 even with the pellet stove roaring, you should feel great satisfaction. That’s a great harvest. I have yet to venture into winter harvesting, it’s on the wish list for this year. Very impressive harvest under the snow! Makes me hungry to see it all. 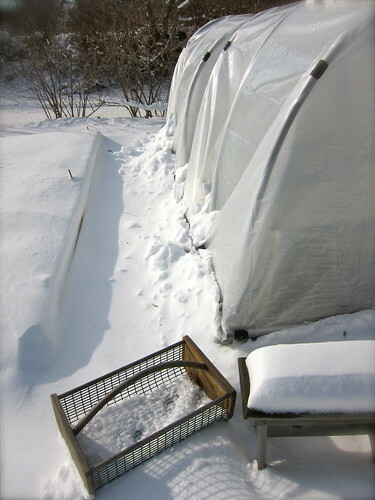 Maybe one of these years I’ll try cold frames–they definitely extend the growing season! 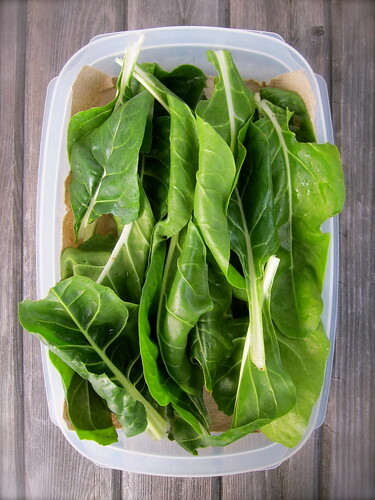 Great looking greens… Happy new year to you and your loved ones! I love the lush green of the plants against the perfect white of the snow. Beautiful and amazing. 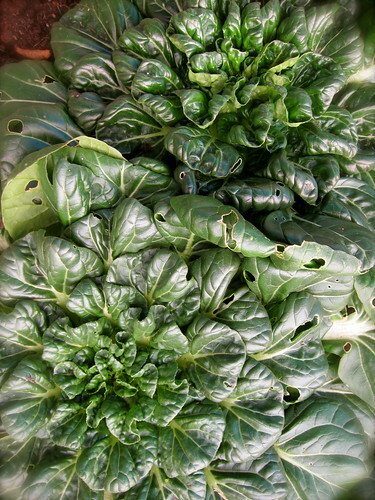 I love the photo of the flattened tatsoi: it looks surreal. Quite a nice harvest, I would say. 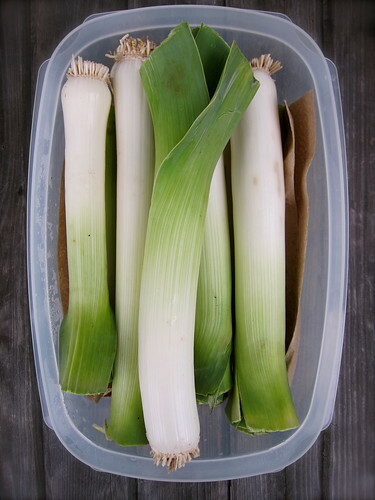 I particularly admire your leeks.